Ashley asks: Why do people have grass lawns? They are so expensive and a lot of work, not to mention bad for the environment. Whose brilliant idea was this? Maintaining the perfect lawn takes a lot of work. There’s mowing, fertilizing, aerating, and watering. Having a trimmed green field leading up to your front door is something of a status symbol, and in some cases having a messy front lawn can get you into trouble with your more obsessive neighbours. Turns out, the grass lawn as a status symbol has its origins in European aristocracy. The very first lawns were grassy fields that surrounded English and French castles. Castle grounds had to be kept clear of trees so that the soldiers protecting them had a clear view of their surroundings. It wouldn’t do for enemies to be able to sneak up on the castle through the forest. Without trees, grasses sprouted naturally just like they do in fields and clearings today. 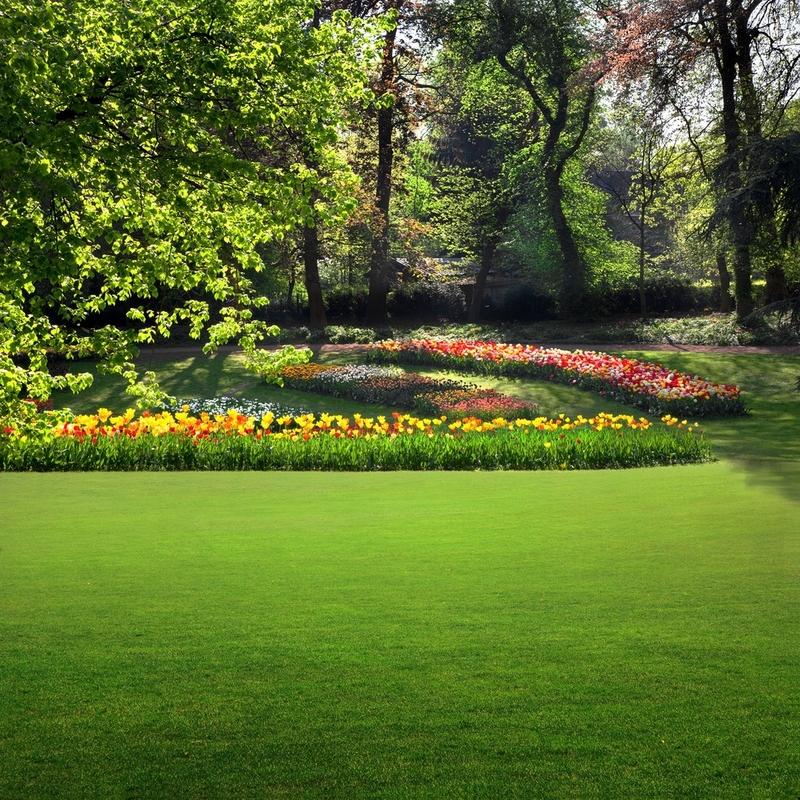 The word lawn actually comes from the Middle English word launde, which meant a “glade or opening in the woods” where grasses were exposed to sunlight and allowed to run wild. Back in the day, a launde could also refer to a common area in a village where farmers were able to graze their livestock. As the sheep and cows “mowed” the lawn, they also left behind fertiliser, ensuring the grass would keep growing. It is believed that such lawns were deliberately cultivated around English and French castles starting in the 16th century. However, it’s thought that chamomile and thyme were commonly used at this point for these deliberate lawns, instead of grass. Both are great alternatives that require less maintenance than traditional turf grass. “Grass,” specifically, is a term for the plant family Gramineae, which encompasses over 9000 different species of plants. By the late 17th century, grass lawns, with the grass cut close to the ground, started popping up on the grounds of the wealthy, such as at the famed Versailles gardens in France where “green carpet” (tapis vert) was included in André Le Nôtre’s landscape design. This practice quickly spread among the elite, who partially used animals to keep things mowed down, but for the very wealthy, hired help was also used. Without lawnmowers, it took a lot of manpower on large lawns to scythe and weed the grass, making a nice, tidy lawn free of animal droppings very much a status symbol. 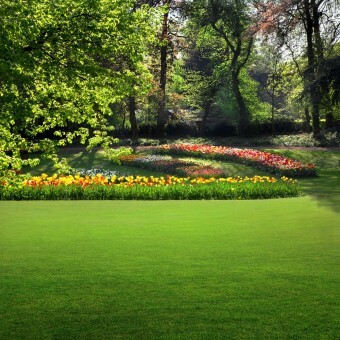 A variety of factors caused grass lawns to become more popular. First, the Industrial Revolution resulted in the first lawn mower, originally developed by Edwin Budding in 1830, and popularized by the late 19th century. Being able to do away with scythes and back-breaking, expensive labour meant that trimmed grass lawns became more accessible to the average person. Secondly, a man named Frederick Law Olmstead, the “father of American landscape design”—who you might know as the man who designed Central Park in New York—was also designing suburbs where each house had its own little lawn. This further popularized the idea that houses should have grass lawns. Ironically, people also wanted to move away from the industrialization of cities and create their own green “Eden” away from all the concrete. So they took their industrial-made lawn mowers to trim up the grass on their new property. Thirdly, the games of golf, bowls, and certain other sports were becoming much more popular in North America, as people were working less hours and having more time to themselves. A lush, green lawn was necessary for these games to be played properly on your own land. That led to some experimentation with turf—the sort of grassy lawn you know today—to develop the best type of grass. For instance, in the early 20th century, the U.S. Golf Association with help from the U.S. Department of Agriculture conducted extensive research on grass cultivation and maintenance. But if we’re to blame anyone for having to mow the lawn every weekend throughout the summer, the man to blame is Abraham Levitt, the founder of Levittown (declared the “ideal” of American suburbia in the late 1940s and early 1950s). Levitt and his sons created the first suburb where healthy lawns were already in place when the occupants took possession of their new homes. The new homeowners were given pamphlets and flyers about the importance of maintaining a perfect lawn, with tips about how to keep it green, lush, and weed-free. No single feature of a suburban residential community contributes as much to the charm and beauty of the individual home and the locality as well-kept lawns. The original Levittown community (which when it debuted saw over 30,000 people touring the model homes on the first weekend alone) and those that followed were so popular that they ended up having a national effect on the United States, with grass lawns becoming the gold standard of suburbia in general, as it is to this day. And the rest, as they say, is history. Besides the massive water usage, the fertilisers and pesticides used to make lawns beautiful run off into gutters, streams, and water sources, making them harmful to animals and others who try to drink from them. Because of this, towns are starting to ban using such things on lawns. Around 3 billion man-hours are spent every year in the United States mowing lawns. For reference, Wikipedia to date has taken about 100 million man-hours to create. In in a typical month, people in the U.S. alone spend about 1.5 billion man-hours watching advertisements on TV, or about 18 billion man-hours per year- that’s just on the TV advertisements, not the actual shows. At its peak, there were about 400,000 people working on the Apollo program, which ran from 1961 to 1972 and put a man on the Moon in 1969. We can get an approximate upper bound on man-hours during the Apollo program up to the Moon landing if we assume all 400,000 people worked 40 hours per week every week from 1961 to Armstrong stepping on the Moon (which is a gross over exaggeration, as the program started with just 10,000 people and many involved had significantly lesser roles. Of course, I’d imagine many involved put in a lot more hours per week than 40, but it’s still probably a gross over estimate… work with me here people ;-)). This upper bound comes out at about 6.7 billion man hours. The real number is probably significantly less. So it’s probably not that much of an exaggeration to say that the amount of man-hours spent mowing lawns every year in the United States isn’t that much less than what it took to put a man on the Moon. On average, a well-landscaped grass lawn in the United States will increase the value of your home approximately 11% over one without, according to the National Association of Realtors. As the “perfect green lawn” was the ideal just a few generations ago, many families have kept up with the idea that front lawns need to be made up of green grass. However, the “front yard farm” has started taking off in recent years, but at a cost. People with front yard farms have planted fruits and vegetables in order to make their households more sustainable. In one famous case, a Florida couple who had maintained their front yard farm for seventeen years was told to dig up parts of it. The reason is that they grew vegetables, and there is a law in Miami Shores that states you can’t grow vegetables in such a location. The couple are still battling for the right to grow whatever they’d like in their own front yard, with the town board fighting them all the way. Why that particular town cares so much, considering they allow fruits, is anybody’s guess. Other towns with similar ordinances have gradually been doing away with such laws. Both George Washington and Thomas Jefferson were known to have had grass lawns on part of their properties. Clover did not used to be considered a weed in lawns, as they actually helped take nitrogen from the air and put it into the soil where grass could use it. However, a pesticide developed to kill dandelions also killed clover, which caused it to gain “weed” status. Water is required to stay alive. Lush lawns and golf courses in the desert are not! California is drying up to dangerous levels depleting its aquifers. Wake up America! There are attractive alternatives to grass lawns. Native plants and ground covers are a good place to start. Lawn Care in the U.S. has now reached a 40 Billion Dollar Annual waste of money. very well written and amen. the description is quite accurate. go to facebook, type in my name tom d sherman, then hit noise reduction. there you’ll find a $5 modification of a reel mower that greatly improves it making competitive or superior to gas. i use this type reel. You know what is even more interesting to look up? The racist birth of the “suburb”. This was begun and is maintained by racist federal policy called Redlining. In the 1930’s FDR created loan programs to help Americans finance these new homes. But- to help decide who got those loans the government created color coded maps in which green neighborhoods were good and red neighborhoods were bad. Of course the minorities lived in the red areas and were denied loans. Developers like Levittown expressly prohibited non whites and the government encouraged this policy. From 1934-1968 98% of all home loans were given to white families. This advantage compounded over time, the families in the green-or white neighborhoods were able to accrue wealth. In the green neighborhoods the influx of new wealth attracted new businesses which caused property values to go up, which meant that white families could sell their homes and send their kids to college, passing down their wealth and advantages to future generations. Meanwhile the red neighborhoods had far less ability to build wealth and many remained trapped in poverty. Today, 70 years after Levittown was created, it’s still less than 1% black. This is still an issue with most suburbs, and because most schools are funded by property tax the segregation issues are worse now for non-white kids in schools across the country than in the 60’s & 70’s. So annoying neighbors with lawn obsessions are the least of our problems as a community. I believe this is the story that we should be spending our time telling, if feeling bigger than someone else isn’t the true moral of the tale . The lawn appears to be a European invention, which makes ecological sense because the moist, mild, climate of Europe supported open, close-cut grasslands. (The less temperate climate of North America does not.) The Middle English word launde originally referred to a glade or opening in the woods, but later designated artificial stretches of land that resembled such glades. Some of the earliest lawns were the grasslands around medieval castles in France and Britain, kept clear of trees so guards had an unobstructed view of approaching, perhaps hostile, visitors. The term also referred to the village “commons”, the meadows shared or held “in common” where villagers could graze their sheep and cattle. These hooved lawn mowers kept the grass cropped, fertilizing as they grazed. Talk about organic lawns. Yes England has perfect weather for lawns as it rains all the time they’re very nice and green, southern parts of europe don’t have any lawns though. If you don’t want or need all the food, sell it at the local farmer’s market and put the money towards next season’s garden or give it to family, friends or the local food pantry to feed the hungry who don’t have the land to grow their own food. It helps you to get out in nature and gardening helps depression. Join some online gardening groups and connect with other folks. You can still have grass in other areas for games or dog bathrooms or just to have a picnic on… but a property line to property line grass lawn is a water sucking enemy of your wallet and of the earth. Too much water is wasted on something only cats and dogs eat occasionally. Oh, at the pet stores they sell seeds for “cat grass” specifically for your pets to eat. I personally recommend having a small, maybe a 2 foot square, just for the cats and dogs to eat. If you don’t go organic anywhere else make sure this area stays chemical free. It is salad for the pets, not a place for any chemicals! come to think of it.. the lawn waste a lot of space and resource…as mentioned.